holds its second national Tower Week. PASMA has been campaigning this year to ensure that people using towers know the importance of keeping safe and using the right equipment, as falls from height remain a major cause of injury at work. Tower Week will also help highlight PASMA’s Not on Your Life campaign which explains what makes a safe or unsafe tower, and offer a range of other advice on a dedicated website (towerweek.pasma.org.uk). PASMA’s activities during the week will be centred on this website, which will host a quiz, the Tower Test, with the association giving a pound to Children In Need for every test completed. Aimed at highlighting safe working practice through good and bad examples, the multiple choice quiz displays pictures of towers and asks what – if anything – is wrong with them. Other activities include the ‘Tragically Terrible / Truly Terrific Towers’ social media campaign which asks the public to send in pictures of tower use (to [email protected]). These will then be ranked out of ten by PASMA’s experts, and posted with this rating on the association’s Facebook page. Across the UK and Ireland, PASMA’s members will be championing tower safety andbest practice at the same time as raising money for Children in Need. PASMA Chairman Chris Blantern will be travelling the length and breadth of the country visiting as many PASMA training centres as possible. 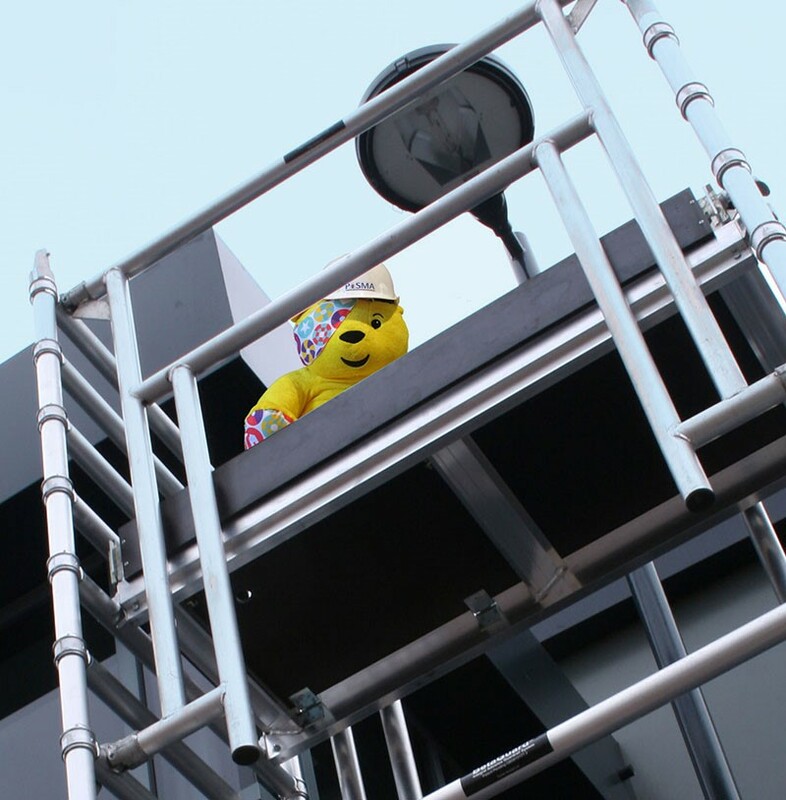 He will be accompanied by Pudsey Bear who plans to promote safety and raise money by climbing a scaffold tower at every venue. Donations can be made at justgiving.com/PASMA. Finally, the week will also be marked by the release of the latest Tower Safety Packs. Thousands of the free packs were sent out last year, giving people a wealth of knowledge vital to working at height. This year’s packs will be sent free to anyone who takes the Tower Test on the Tower Week site. More details about what will be happening during Tower Week are being revealed as the week approaches, both on the dedicated website and on PASMA’s site (pasma.co.uk). A Tower Week e-newsletter will also keep people who sign up to it on the Tower Week site up to date.